Thick 1/8" polyfoam absorbs shocks and impacts. Non-abrasive protection of delicate items. Protects any size or shape item against dust and dirt. Lightweight material for reduced shipping costs. CFC free. Comes in a convenient dispenser, perforated every 12". FOB Shipping Point. 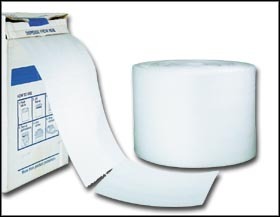 HFOAMPACK- Ships UPS Dimensional Weight. H18FOAM4812and H18FOAM4824- Ships via truck only. Product No. Roll Size Wt. (lbs.) Ca. Rolls/Case Price Per Ca. Please order case quantities only.